It’s no secret that I and many others have decried the decline of traditional hand-drawn 2D animation. Although 3D computer animation is often visually stunning and technically accomplished, it’s hard to replicate that endearing hand-crafted feel. But, while hand-drawn animation is now more often the purview of indie and foreign films, alternative animation styles have been experiencing a much-welcome renaissance in the western world, thanks to the painstaking process known as stop motion animation. Stop motion, and its sibling, Claymation, have resulted in modern classics like Aardman’s Wallace & Gromit: The Curse of the Were-Rabbit and Laika’s Kubo and the Two Strings. But stop motion has also become the passion of specific American directors. Most notably, Tim Burton has adopted the painstaking process, where elaborate figurines are photographed frame by frame, for Corpse Bride and Frankenweenie. Wes Anderson, America’s indie darling, adapted a children’s book for Fantastic Mister Fox. Now, Anderson has returned to stop motion for his allegorical adventure Isle of Dogs, and the results should please both Anderson acolytes and fans of thought-provoking, visually stunning animation. The film takes place in a futuristic Japanese town where an outbreak of disease has threatened the dog population. To prevent the disease from spreading to humans, Mayor Kobayashi (Kunichi Nomura) banishes all dogs to a large, elaborate landfill, where all the other unwanted refuse of society goes to rest. Here, in this stark but oddly beautiful wasteland, a roving pack of dogs fights to survive. The pack is supposedly led by surly stray Chief (Bryan Cranston), but he frequently clashes with the strong-willed Rex (Edward Norton) and his posse of former house pets (voiced by Bob Balaban, Bill Murray and Jeff Goldblum). Their hardscrabble existence is upended when a makeshift airplane crash-lands on the island, carrying a boy named Atari (Koyu Rankin). The boy has stolen the plane and traveled to the island in search of his lost dog, Spots, but he is soon followed by the high-tech hounds of the Kobayashi empire. You see, Atari is Mayor Kobayashi’s nephew/Ward, and the suspiciously cat-loving mayor can’t have Atari wandering about spoiling his plans. Another fly in the mayor’s ointment: American foreign exchange student Tracy (Greta Gerwig), an intrepid news reporter with an unshakable hunch that there is a deeper conspiracy going on. Is all of pet kind really at stake? If so, Chief, Rex and the gang may have bitten off more than they can chew. Isle of Dogs is a movie filled with risky decisions, even for a filmmaker as in love with risk as Anderson. The first risk is making a good chunk of the human dialogue in Japanese, while giving the dogs English voices. What at first seems a strange disconnect soon turns into a bold and frequently entertaining creative risk. I love all the tactics Anderson comes up with to interpret for the audience: sometimes it’s on-screen text, sometimes it’s an on-screen interpreter (yes, that is Frances McDormand as Kobayashi’s official interpreter), sometimes it’s nothing at all (we never, for example, get subtitles for Atari’s frequent dialogue, and even the dogs are confused, since none of them speak Japanese). Anderson and the actors do a terrific job of mining the lack of communication for big laughs, and also leave room for a potent statement about modern communication and the ways in which we talk past one another. The gorgeous animation and memorable characters of Isle of Dogs should make this colorful confection irresistible to just about anyone. Similar to the dialogue, the visuals of the film also cobbled together in a way that somehow still feels impeccably crafted and deliberate. There’s just something so endearing and heartfelt about a film entirely crafted by hand, and it’s a joy as a viewer to recognize the extreme attention to the detail the filmmakers bring to the project. Is that cloud made of cotton? Is that parachute made of tinfoil? How many days of painstaking work did it take to film that very brief sumo wrestling scene? Or that miniscule cherry blossom wafting onto a dog’s cheek? Make no mistake: Isle of Dogs is a true game-changer from a visual perspective. It’s at the same level as Kubo and the Two Strings in terms of pushing stop motion animation forward, and like Kubo its filled with vibrant colors and details inspired by Japanese culture and myth. But, while Kubo was designed to look more like paper craft, this film feels more like a 3D felt board played upon by the most wild imagination in all of film-making. There are even sequences that transition to vibrant, traditional hand-drawn animation, showing that Anderson and company are aware of and grateful for the films of the past that inspired them. One of the main reasons I’ve been so ambivalent to Wes Anderson as a filmmaker in the past is that his characters can often feel more like caricatures than flesh-and-blood creations. It has nothing to do with style: Anderson creates fantasies and fables, and “realism” is not in his cinematic language. Rather, I feel as though his characters are often reduced to catchphrases and quirks, and the more odd chaps he adds to his elaborate dollhouses, the less they make an impact. While I enjoyed Fantastic Mr. Fox, it still mostly felt like a traditional Anderson movie with a different coat of paint. Thankfully, Isle of Dogs sidesteps many of those concerns by giving us richly drawn characters and a timeless fable about the bond between a boy and his pet. I love the film’s use of flashback scenes to flesh out its characters and, while not all of them get this treatment, the story’s most important players do. This context gives the film an emotional resonance that I feel Anderson’s work often lacks, as do the subtle-but-effective themes of death, racism, prejudice and government corruption. Isle of Dogs is, in many ways, a movie for adults. It’s certainly sad and disturbing enough to turn away little kids. But, for older kids and teens especially, I think there is an irresistible undercurrent of melancholy behind all the colorful visuals and adorable dogs (seriously, they’re cute) that many may find irresistible. And, along the way, they might get a valuable lesson on the importance of treating “the other” with dignity and respect (and, while we’re at it, the importance of a free and independent press in holding politicians accountable). Come to think of it, these are lessons many of us adults need to learn as well. Wes Anderson is no revolutionary when it comes to politics, and unlike recent animated efforts like Zootopia, Isle of Dogs isn’t at all didactic or heavy handed in its messaging. It’s simply a sweet, creative story, told with impeccable craftsmanship by a filmmaker at his creative peak. This is one of the more memorable animated films of recent years, and certainly one of Anderson’s best. The eccentric and beloved auteur may have finally (literally) crafted a film that anyone can enjoy. Few people have more of a reason to be nostalgic for the 1980s and 90s than Steven Spielberg. The veteran filmmaker filled those decades to the brim with his most crowdpleasing hits (Raiders of the Lost Ark, E.T., Jurassic Park) as well as his most critically acclaimed and well-respected work (Saving Private Ryan, Schindler’s List). It seems like a match made in heaven, then, for Spielberg to bring an adaptation of Earnest Cline’s nostalgia-fueled novel Ready Player One to the big screen. And, for the most part, that assumption proves correct. Like the book itself, Spielberg’s latest sci-fi extravaganza is equal parts breathtaking, cheesy, self-indulgent and deeply geeky. Most importantly, however, it’s a ton of fun. The fairly boilerplate story is set in a futuristic, dilapidated version of Columbus, Ohio, the hometown of the legendary gamemaker James Halliday (Mark Rylance), where acolytes have flocked to gain some wisdom from the man who redefined their existence through his creation called The Oasis. Think of it as a virtual reality version of an MMO, with people plugging in to tune out of their semi-apocalyptic existence. In The Oasis, you can be whoever you want to be, go wherever you want to go and do whatever you want to do. Wade Watts (Tye Sheridan) is one of those acolytes, and like many others he is hoping to gain access to Halliday’s ultimate easter egg. Upon his passing, Halliday left announcement claiming that he hid three keys across The Oasis. Finding the keys leads to a door, which leads to a golden egg, which represents complete control over The Oasis and access to Halliday’s vast riches. In order to improve their real-life existence, thousands of people must obsessively pore over pop culture history and spend most of their days inside The Oasis in order to crack the code and overtake the most powerful company on earth. Wade enlists the help of a team of misfits including his best friend Aech (Lena Waithe) and a mysterious resistance fighter known in the virtual world as Art3mis (Olivia Cooke). After Wade, whose digital handle is Parzival, finds the first key, he becomes a celebrity, drawing the attention of adoring fans but also the murderous ire of Nolan Sorrento (Ben Mendelsohn). Sorrento leads a powerful corporation hell-bent on solving Halliday’s puzzle and using the Oasis to sell advertising, but their ownership of the company could have nefarious real-world implications as well. Ready Player One has gotten a lot of attention in recent weeks, not all of it positive. The backlash to the book has been severe, with many calling it glorified nostalgia bait, a series of references in search of a story. The same complaint could theoretically be leveled at the film version. Adapted by Cline himself along with Zak Penn, the script spends a great deal of time calling out pop culture references both visual and verbal. But, like the book, I think the film does a good job of tying said references into the main thread of the story. After all, to win Halliday’s challenge our heroes must obsessively geek out over small, minute details of pop culture past. I for one think it’s rather brilliant to essentially ask the audience to do the same thing along with the characters. Are there references for the sake of references? Sure, but they fit well into a virtual world where everything is a walking advertisement. I understand folks who despise the idea of a movie concocting a reason to show us a bunch of other stuff, but how many of these critics have stepped foot inside a comic convention, where every booth is pandering to our fondness for things we already like in order to sell us a product? 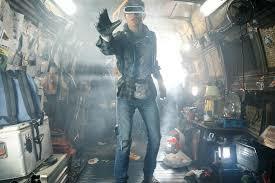 Ready Player One is a visually stunning and fun tribute to pop culture past. That’s not to say that the film is flawlessly written. It’s definitely too long, and Spielberg struggles to make the real-world action match the intensity and thrills of the virtual set-pieces. Also lost in adaptation are some of Cline’s richly drawn characters. Parzival and Art3mis’ relationship is given enough depth, as is Art3mis’ complex reasons for desiring the egg. But Aech is less fleshed out than the character deserves, acting more as a walking set of references and phobias than an actual person. And Sorrento is a typical walking suit, obsessed with money and prestige and little else. I love seeing some of my favorite young actors working on such a massive project, but my favorite performance and character in the film is Rylance as Halliday. He brings a subtlety and a sadness to a story that doesn’t have enough of either. On the other side of the coin, I absolutely loved T.J. Miller’s I-R0k, a powerful shaman inside the Oasis who provides the film’s best comic relief. His one-liners are golden, and I’d put money down for a spin-off film starring him (especially since we don’t ever get to see his real-world identity here). One advantage the film adaptation has over the book is its visual design, and this is truly the movie’s selling point. This is a technological stunner, perhaps the biggest leap forward visually since Avatar or Rise of the Planet of the Apes. It’s often difficult for movies to convey the full visual weight of a universe where choice is at the center, but this is an easy exception. Every frame is bursting with color, every shot filled with something to dazzle the eye (were those Battletoads charging into battle alongside the Teenage Mutant Ninja Turtles?). So many of the references are fun precisely because you can’t catch them all. Half-second flashes of favorite characters fit nicely alongside the more blatant references, keeping us on our toes as we scan the screens for glimpses of our favorite character. Ready Player One is essentially half-animated, and thankfully Spielberg handily avoids the uncanny valley, with fun character designs inside The Oasis and expressive facial animations that rarely look creepy or unnatural (not anymore than intended, at least). However, it’s the action set pieces that truly knock this one out of the park. Check out the twisting car race that leads to the first key, featuring shifting courses, King Kong and a giant T-Rex. Or my favorite scene, a gripping bravura set piece set inside Stanley Kubrick’s The Shining. The epic final battle feels less engrossing, but perhaps that’s because, aside from the sheer variety of characters that fill the screen, it’s nothing we haven’t seen before. Ready Player One is pretty much exactly what most people will expect going in. It’s ambitious, silly, over-the-top and a total blast. Those who scoff at the film’s very premise are not going to be swayed. Those anticipating a good time will certainly find it here. But, at its core, the film has a genuinely good heart and a sprinkling of that inexplicable Spielberg magic. Think of it as a really long roller coaster ride: fun while it lasts, not exactly life changing, but something I can’t wait to ride again. This is one easter egg worth cracking.